Save on the Cost of Private Jet Travel with an Empty Leg Flight! Find an empty leg flight to Orlando and arrive in the most comfortable, luxurious way possible, all without spending more money than Scrooge McDuck. Home to the Happiest Place on Earth, Orlando welcomes millions of visitors every year, and private charter flights are a popular way for families, executives, and luxury travelers to get here. Central Florida is also a busy private jet hub, with executive and private airports in Tampa, Daytona Beach, Lakeland, Clearwater, and more. All of these charter planes flying to/from Orlando create daily opportunities for you to book a empty leg to Orlando for a fraction of the cost! Our charter brokers have access to thousands of planes across the country, connecting you to empty leg flights to Orlando or any destination worldwide. 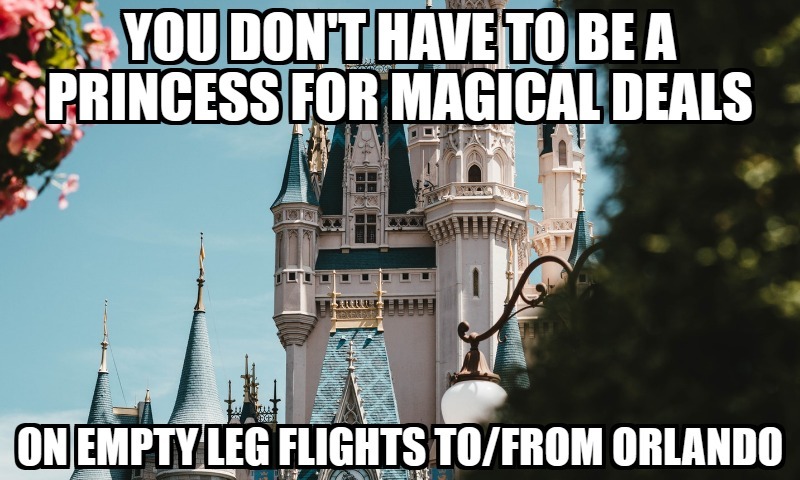 Call us at +1 (888) 987-5387 for pricing and availability on empty legs in Orlando! Flights on empty legs, also known as “deadheads”, become available when an aircraft is scheduled to fly without passengers on board. As flights are booked for specific planes, deadhead legs are created when a plane needs to relocate to pick up passengers, return from dropping off passengers, receive maintenance, and other reasons. In the case of one-way flights, the person booking usually responsible for the empty re-positioning flight. However, every time a plane takes off with only the flight crew, operators and owners are losing money on the plane. Since the plane’s operations are either paid for or not generating revenue, the empty portion of the flight is marketed and sold, often at a large discount. For example: a private flyer books a one-way flight from Miami to Chicago, and they are charged for the return flight back to South Florida. After flying to Chicago and dropping off the one-way passengers, the plane is scheduled to return to Miami. This creates an empty leg flight, and can be marked down as much as 50 percent or more! Transient planes don’t need to match your exact routing, either — if you’re looking for a one-way from St. Louis to Orlando, we can arrange for the empty plane to leave Chicago, pick you up in St. Louis, and drop you off in Orlando before finally arriving back in Miami! You’ll also save more money by being as flexible as possible with the dates, times, and airports for your flight. Aircraft availability across the empty leg market can change by the hour as flights are booked throughout Florida, so it’s important you’re ready to book when one becomes available. Even if we can’t find a suitable transient jet, we still offer the best air charter services in Florida with the most competitive rates in private aviation. How do I find an Empty Leg in Orlando, FL? Empty legs are heavily marketed across the charter market, and are usually scooped up quickly by savvy flyers. How do you get your hands on these empty leg deals in Orlando? Call us anytime, anywhere and tell one of our brokers you’re looking for an empty flight, and give us your routing. Our jet charter brokers are able to view every plane on the charter market, locating transient planes through Florida and across the US to match one to the routing of your flight. And, unlike a specific operator, we’re able to see every empty aircraft available, finding you the best deal by comparing costs between planes. Central and Northern Florida are home to thousands of charter planes stretching from Jacksonville to Tampa, and Melbourne to Pensacola. Whether you’re looking for an empty leg from Orlando or the best deal on a one-way flight from anywhere in the world, book an empty plane with us and save on the cost of your private jet charters! Orlando Jet Charter offers 24/7 air charter services around the world no matter where you’re located. And, our quotes are free and require zero commitment to book, making it easy to receive more information on empty legs to/from Orlando, FL!